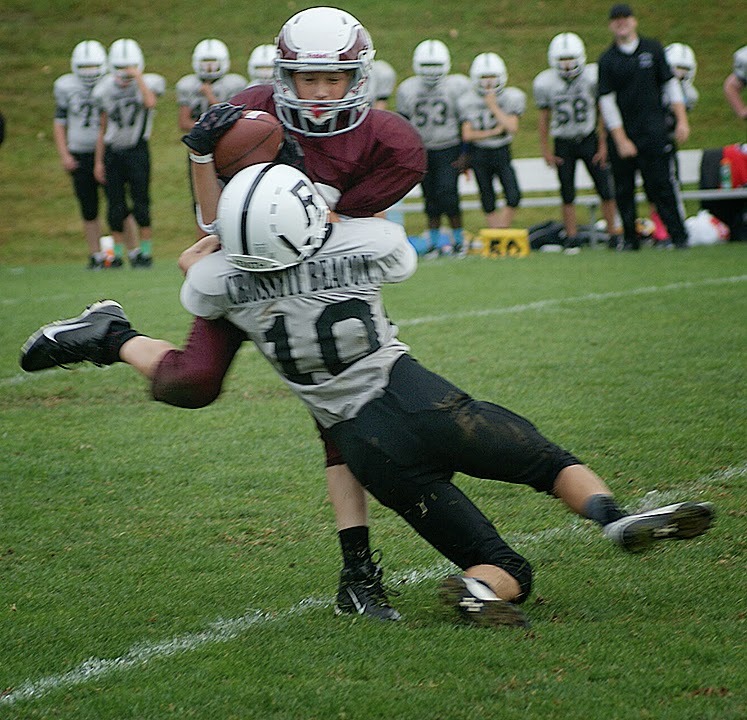 The undefeated Portland middle school football team came to Windham last Sunday and, thanks to some big plays, emerged with victories in the varsity and junior varsity games. 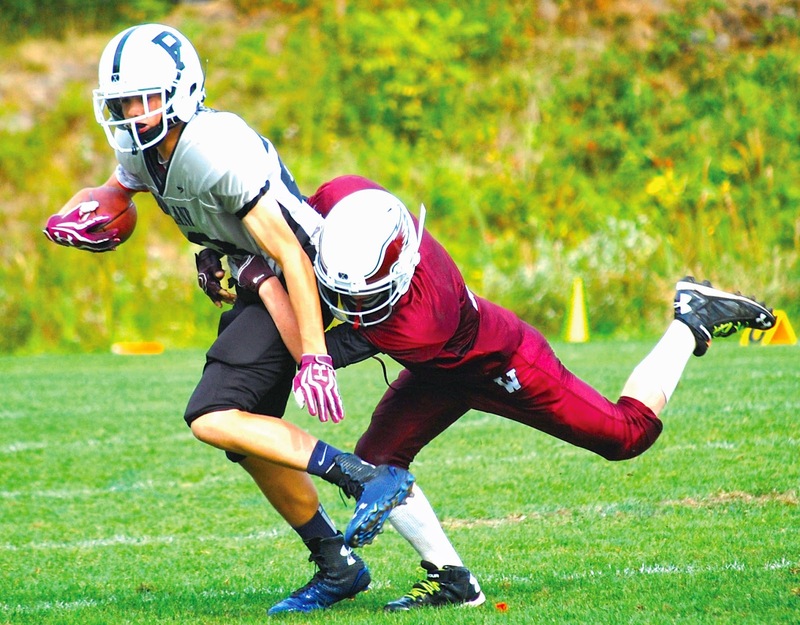 “We are a team that seems to be mired by one mistake that results in big plays,” said Windham head coach Tony Leslie. In the varsity game, Windham received the opening kickoff, but couldn’t get started offensively and punted away the ball after three plays. The Eagles were playing without Ricky Brichetto, a starter on the offensive and defensive lines. Portland appeared to score on a long touchdown run that was called back on a holding penalty, but on the next play, they drew first blood at 6:47 in the first quarter. With Windham on the march, Portland intercepted a pass by Windham quarterback Blake Houser. A long run later and Portland was up 14-0. When Windham’s Treva Valliere got a kickoff he could field, he made the best of it, running the ball down to the Portland 30. Valliere also had a great day kicking and punting the ball. Houser’s favorite target, Garrett Peeples hurt his hand in the second quarter, but when he came back into the game, he hauled in a spectacular catch at the Portland 9-yard line. On the ensuing play, wide receiver Parker Varney laid out for an awesome Windham touchdown 20-6. Houser punched in the conversion to put the score 20-8. With Portland driving just before the half, Windham defensive back Michael Fahey intercepted a Portland pass to give Windham an opportunity to close the gap. The score at the half remained 20-6. In the third quarter, Windham was playing Portland even, but another big play resulted in a Portland touchdown, putting the visitors up 26-8. Peeples crushed the attempt at a two-point conversion with a punishing tackle. With Corbin Judy and George Butts filling in for Brichetto at nose tackle, Windham hung tough with its undefeated opponents. Windham got the ball and was moving, but a lost fumble late in the third quarter resulted in another Portland score. With the score 32-8, Houser found Peeples for a great catch at 5:32 in the fourth quarter and Houser ran over a Portland defender for the Eagles’ second touchdown. That was it for the scoring and Portland won 32-14. In the junior varsity game, Portland won 22-0 with Windham having a tough time battling the visitor’s line on each side of the ball. Injuries to Mattingly Babb and Judy also had an affect on the game. Ever the optimist, Leslie said, “If we face Portland again, get everybody healthy and get everybody working as a team at all times, it will make a difference.” This coming Saturday, September 27, the middle school teams play Massabesic at the high school stadium with the JV game starting at 6 p.m. and the varsity game to follow. Michael Fahey intercepted a Portland pass before the end of the first half. Photo by Eric Colby. Windham’s Corbin Judy played well on defense in the varsity and JV games. Photo by Carrie Wall.